The T67 is an American tier 5 turreted tank destroyer. The T67 is considered a very fun and overall good tank to play. Its best features are its guns, particularly the 76mm M1A1, along with its superior speed and acceleration. When first purchased, it is very weak and has low engine power, but once fully upgraded, it is a force to be reckoned with. It can maintain its 61 kph top speed quite easily over all terrain and though the turret traverse is incredibly slow, the tank excels at flanking and exposing weak sides and rear. Although it has low penetration, its gun can penetrate almost any armor it comes across by hitting weak spots, and by the time they've been hit you'll most likely have had time to run away. In higher tiers, it can even be used as a heavily armed scout. Like most turreted TDs, its armor is sloped but incredibly thin, so don't expect to bounce much. In fact, if you try to use it as a classic stationary sniper TD, you'll probably be mercilessly destroyed. However, you will be very successful if you use this tank's superior speed and maneuverability to its best. A good example of this fact is that due to your high speed, you can "chase" enemy scouts, and get some damage done before the scout escapes. 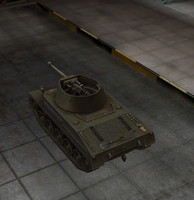 The T67 leads to the M18 Hellcat. 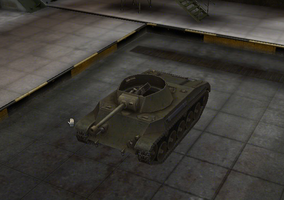 The T67 is very similar to its parent tank the M8A1 in many ways. It maintains similar speed and agility characteristics, in fact improving slightly on overall agility, while at the same time gaining some firepower; and while slow, the turret traverse is still faster than that of the M8A1. Its acceleration is as good or better than most light tanks at tier. In terms of gun selection, sticking with the 57mm until the 76mm M1A1 is available is seriously worth considering, as the 76mm L/50 lacks in penetration. Additionally, the 57mm's rate of fire more than compensates for its lack of alpha damage. The top tier gun for the T67, the 76mm M1A1, excels in nearly all areas in terms of damage, rate of fire, and penetration over both the 76mm L/50 and the 57mm. If you've played through the American medium tree at all you'll find that the engine will carry over. Be aware that despite the similarity in name, the 76 mm AT Gun M1A1 used by the T67 has "AT" in the name. It is different from the M1A1 used by the M4 Sherman and T1 Heavy, and the gun does not carry over from the medium/heavy line. T67 can be used to scout to some extent. Use this as your advantage and with your speed, locate enemy tanks, report their location to your team, track and do damage to them and escape before they even realize you were there. However, you are still a tank destroyer and your gun is too powerful to be wasted by dying too early in game, so be careful. Also note that you don't have the same camo rating when moving as light tanks even if your camo holds well when sitting stationary in a bush. The T67, once fully upgraded, can almost be played in a manner similar to that of a scout or flanker. You're fragile (very important to remember this), you have excellent firepower for your tier, and you retain the ability to sneak up on the enemy. Play the T67 as a second line tank and you will succeed. Don't lead a push, as your armor can't take the hits. Simply follow the main push, support the tanks that are pushing, and clean up the stragglers. Or you can snipe at long range with the excellent gun. The radios carry over from the M8A1 and the best one should be installed immediately. The 76 mm AT Gun M7 L/50 also carries over but requires the second suspension and turret. 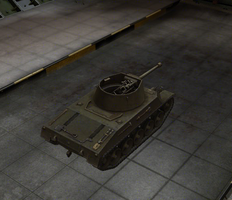 The 76 mm AT Gun M1A1 carries over from the T40 if you played it previously, but again it requires the second suspension and turret. Research the Wright Continental R-975C4 engine first if you don't already have it unlocked. 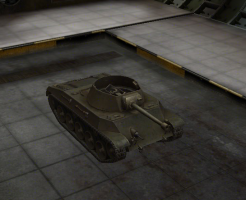 Now you can research the second turret in preparation for the 76 mm AT guns. 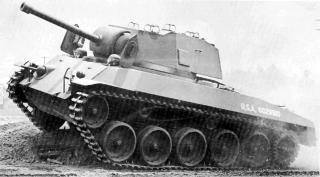 The T67 Gun Motor Carriage was a variant of the M18 Hellcat. 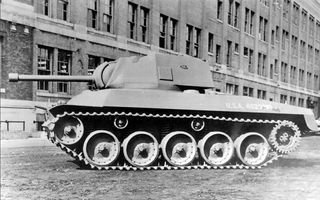 On April 18, 1942, it was agreed to construct two prototypes that would be identified as the T67 Gun Motor Carriage. It was to be mobile, weigh around 12 tons, have a crew of five, reach a speed of 50 mph, armor was to be 7/8" on the turret, and 3/8" all around on the hull. This page was last modified on 21 January 2017, at 06:56.